Producing high quality lumber is more than what we do... it's our passion. Since 2005, we have been marveling at trees and wood, seeing it for more than the bark it is encased by. The stories trees tell, the shapes and history they carry galvanizes us to pull out the unique beauty of every piece and then share it with others. Tim Layzell started the company with a mission to save and bring out the beauty in trees that were destined for a stove, firepit or wood chipper. Now he works beside others who share his passion. At Jewell Hardwoods, we hire team members that are enthusiastic about their craft and good stewards of their talent. The magnificent natural beauty we have the privilege of bringing back to life inspires each of us. Watching logs that may have been cut into firewood turned into amazing works of art continually inspires our creativity. Seeing the raw and exquisite character of our slabs crafted into gorgeous furniture gets us out of bed each morning. It’s why we love what we do. Tim’s passion for woodworking began in high school shop class. It continued through college and a career in construction, when he first saw trees being cleared off jobsites and thrown away. His first tree-to-finished-furniture project was a crib for his son. Since then, Tim has been crafting heirloom quality furniture with a story. Days off for Tim look like whitewater kayaking and spending time with his wife, Rachelle, and their three children. What he loves about Jewell Hardwoods: My favorite task in this business is to mill up a log and see what amazing, unique characteristics are hiding inside. Greatest Life Lesson: Life rewards the passionate pursuit of your dreams, but passion cannot be an undisciplined force in our lives. Your passion must be submitted to your long-term plan. Undisciplined passion will burn you out and keep you running in circles. Disciplined passion will be your greatest ally and your strongest driving force. Caring for others in all she does, Rachelle enjoys telling Jewell Hardwoods’ story and helping customers find exactly the perfect product that reflects their style and personality. With past experience managing offices, as well as coordinating and planning huge events, Rachelle has what it takes to make the company run smoothly. Married to Tim, Rachelle’s spare time is spent loving on her family and connecting with their local community to see it thrive. 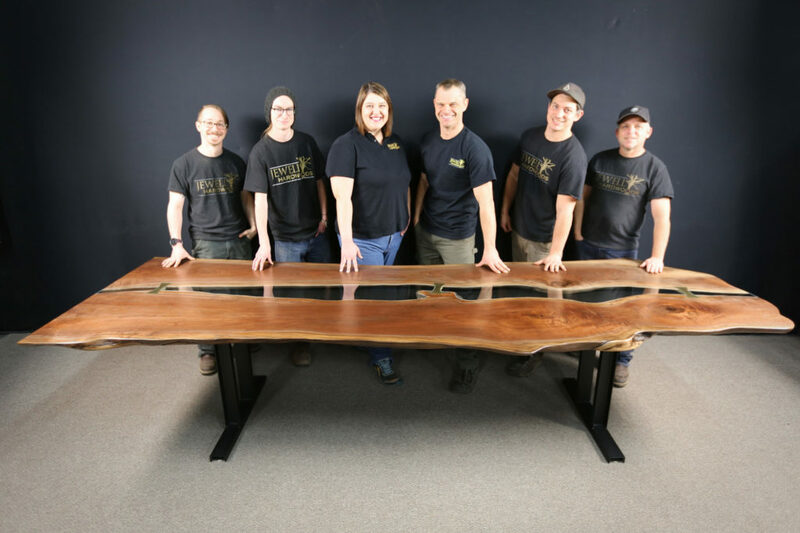 What she loves about Jewell Hardwoods: Seeing the amazement on the faces of our clients when they see their finished Custom Table because I know it is a piece that will be the focal point of their home or business for generations. Joshua began his career in woodworking building guitars, and was eager to join the Jewell Hardwoods team in 2014. As our Shop Foreman he oversees furniture building and finishing, quality control, and employee tasks. An avid runner and musician, Joshua is married and loves spending time with his baby Joseph. What he loves about Jewell Hardwoods: Our owners are a great example of integrity and provide great feedback which allows me to grow and stay encouraged. Greatest life lesson: Believe in yourself. It is better to try and fail than to not try at all. I have realized that I will never accomplish anything if I never attempt anything. A native of Portland, Tony came to Jewell Hardwoods in 2016. He is responsible for maintaining our showroom and inspecting our finished product, as well as building our furniture. Tony loves working with customers and helping them find just the right slab for their project. When he was young, his father taught him how to live a life of giving and caring for others and Tony translates that right into his work with our team and our products. After work you may see him on a dance floor around town as he is an accomplished ballroom dancer. What he loves about Jewell Hardwoods: I find great joy and satisfaction in working with wood and creating custom pieces of heirloom furniture. Daniel began his career with Jewell Hardwoods in 2017. He loves to be out in the yard milling, filling the kiln and organizing the hundreds of slabs air drying. After he came on board we found out he loves custom glasswork. He has done the hand cutting for many of our new glass insert tables. You will also see him in the shop finishing furniture. Daniel is married and lives in Boring. David came to us with a desire to work with his hands to create beautiful things. He loves learning and examining the details to create beauty out of a piece of rough lumber. David enjoys spending time with his wife and twin son/daughter. As well as, write music and read philosophical, religious or poetic texts. What I enjoy most though is the family atmosphere we have here at Jewell Hardwoods. We all take great pride in our work, and have great appreciation for our coworkers.